Gagaku is the oldest of Japans performing arts, with a history of more than one thousand years, and is the oldest living ensemble music in the world. In its contemporary sense, the term gagaku signifies the whole body of classical Japanese music and dance performed by the musicians of the Kunaicho Gakubu (Music Department of the Imperial Household Agency, Tokyo). Until the 1960s, composition of new pieces for the genre was often seen as an affront to the dignity of the tradition. The situation is changing, however; since its establishment in 1966, the National Theatre in Tokyo has contributed significantly towards developing new possibilities for gagaku performance, and the emergence of new performing groups like Reigakusha, less bound to the official version of the art, has made it easier for new possibilities to be explored. Recorded on this CD are two taikyoku (extensive suites in multiple movements), the first a suite that was a taikyoku only at the very beginning of its history in Japan (Sandaien), and the second a suite belonging to both the ancient and modern class of the central four (Shunnoden). The first is performed in kangen style, that is, as instrumental music with winds, strings and percussion. Lost parts of the suite have been recomposed by Sukeyasu Shiba according to a method of reconstruction that he outlines in his notes. The second is performed in classical bugaku style, that is, to accompany dance, with winds and percussion. 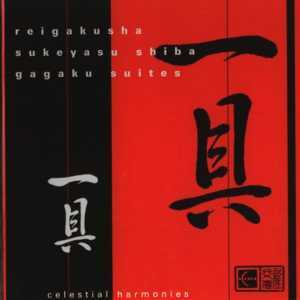 This is the third recording in Celestial Harmonies series documenting Japanese gagaku music. Gagaku and Beyond (13179) and Gagaku: "Gems From Foreign Lands" (13217) have proven to be essential additions to the Celestial Harmonies catalogue of important cultural documents. This rare and important recording has been put together at the very highest level of expertise. Booklet annotation is provided by Steven G. Nelson, the only Western member on the staff at the new Research Centre for Japanese Traditional Music, Kyoto City University of Arts, Kyoto, Japan. Reigakusha was established in 1985 as a group of professional gagaku performers dedicated to various types of ensemble performance. It is led by its founder and music director Sukeyasu Shiba. The group does not confine itself to the performance of the classical gagaku repertoire, but also performs reconstructions of pieces lost from the traditional repertoire during the long history of the genre, as well as contemporary pieces written for the ensemble. Since its formation, Reigakusha has given regular concerts in Tokyo and other cities in Japan, and has also traveled overseas, to the United States, England, and other European countries. The name of the group, an abbreviation of Reirin Gakuyusha, is a tribute to the ancient Chinese music master Ling Lun, Reirin being the Japanese pronunciation of his name. He is said to have tuned the first standard set of bamboo pitch-pipes on the order of the Yellow Emperor, the founder of the Chinese Han civilisation. Sukeyasu Shiba was born in 1935 into the Shiba family, a branch of the Koma clan of gagaku musicians associated with the temple-shrine complex of Kofuku-ji/Kasuga Taisha in Nara since more than one thousand years ago. He trained and performed as a gagaku musician at the Music Department of the Imperial Household Agency. He has also been active as a composer and scholar, and has devoted much of his energies to reviving lost parts of the gagaku repertoire. After leaving the palace group in 1984, he taught at several universities in the Tokyo area, and the majority of the members of Reigakusha are musicians whom he has taught during his extensive career. 1 Hyojo no Choshi 3'23"
5 Ichikotsucho no Choshi 2'18"